It's Jane Austen's 242nd Birthday and in this 200th Anniversary year, you are invited to a rather special party! 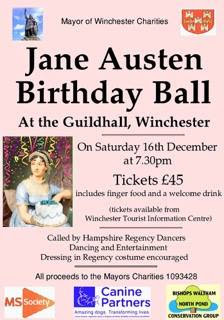 The Mayor and Mayoress of Winchester and The Hampshire Regency Dancers welcome you to a 'Grand Jane Austen Birthday Ball' in the Guildhall's stately King Charles suite. Join in some easy dances of the time which will be 'called' and walked through beforehand to live music. Learn to flirt with your fan and come as your favourite Jane Austen character. You are encouraged to come in Regency costume (which can be hired locally) or Black Tie. Your ticket includes a reception drink, the ball and a variety of delicious canapés and of course, a piece of birthday cake! A cash bar will be provided for all other beverages. 7pm start time (reception) and ball begins at 7.30pm, finishing at 11.30pm. There is a break from the dancing between 9pm and 10pm.